In front of a jam-packed, raucous standing room only crowd of 954, the Northern Illinois volleyball team had its 11-match winning streak snapped by Wisconsin, 25-18, 25-19, 25-18, on Tuesday night at Victor E. Court. In a tilt between undefeated teams, the Badgers remained so at 10-0, while the Huskies’ record took their first blemish of the year, falling to 11-1. The best start in school history, and longest winning streak since 2001, came to a close at the hands of the man who once owned the mark — former Huskie head coach (1988-98) and current Badger head coach Pete Waite, who has the most wins in NIU history (266-102) and led the Huskies to six conference championships and four NCAA Tournaments. In his first trip back to DeKalb, Waite’s Badgers stifled the Huskies all night long, holding edges in kills (43-34), hitting percentage (.326-.158), aces (6-1), digs (37-33), and blocks (7-6). Freshman outside hitter Lauren Wicinski (Geneva, Ill./Geneva) led the Huskies with 15 kills and a .294 hitting percentage, while junior setter Kristin Hoffman (Batavia, Ill./Batavia) picked up 31 assists and five digs. With just four lead changes all night, the Huskies played from behind and struggled to keep up with Wisconsin. In the first set, NIU held a 2-1 lead after a bad set by the Badgers, but that was quickly turned around into a 7-4 Badger lead after three Huskie errors helped give Wisconsin momentum. The Huskies closed within one point two times in the middle of the set, but the Badgers had an answer both times. NIU also took a 2-1 lead in the second set after a Wicinski kill. However, the Badgers once again responded promptly to take a 7-4 lead after an ace, and the Huskies would not get closer than two points for the rest of the set. In the final stanza, NIU scored the first three points on kills by Wicinski and Mary Kurisch and a Wisconsin error. But the advantage was short lived as the Badgers went on a 10-3 run to force NIU into a timeout. Later, down 19-12, the Huskies called another timeout that led to a 5-2 run. NIU received kills two kills from junior outside hitter Allison McGlaughlin (Morton, Ill./Morton), who also teamed with freshman middle blocker Sarah Angelos (Waukegan, Ill./Waukegan) for two blocks during the run. An ace from sophomore defensive specialist Sue Hayes (Evergreen Park, Ill./Mother McAuley) pulled NIU within four points, 21-17, and forced Wisconsin to take a timeout. Out of the break in action, Hayes missed on a serve and the Badgers took back momentum to end the match. The Huskies continue their season-long, seven-match home stand this weekend with a 1 p.m. contest Saturday, Sept. 18, against Youngstown State and a 3 p.m. tilt Sunday, Sept. 19, with Iowa. 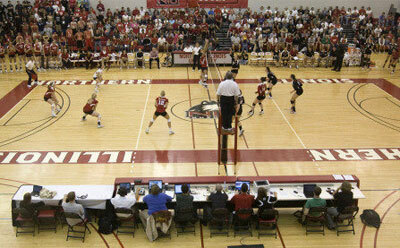 For more information on NIU volleyball and Huskie athletics, visit www.niuhuskies.com.